There's a lot to like about the image. It's nearly all in focus, so much so that you can see the texture of the elytra. Also, it can be enlarged considerably without losing focus. Why was I able to get such a nice shot? Simple, really. I took this picture on a fairly cool, overcast day. There were two benefits: I could move in very close to the beetle without scaring it away, and the diffuse light reduces specular (mirror-like) reflections from the shiny elytra. At Willcox Playa, none of these problems is minimized, and they all work against you. For one thing, the temperatures at the playa are almost always hot. It's an old saline lakebed with lots of white sand. This year when I arrived, temperatures were already in the mid 90s at 9:00AM. Forget the discomfort factor, the high temperatures has the beetles' metabolisms so high that they are very skittish. It's hard to get anywhere near them. 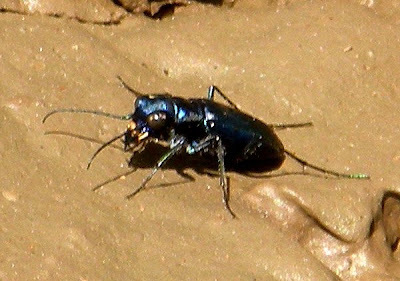 Among the most flighty species there is the Black Sky Tiger Beetle (Cicindela nigrocoerulea). The photo above was taken with the zoom at full extension. With the zoom way out, it's hard to keep the camera still and focused on a really small target like a tiger beetle. Moreover, the photo is heavily cropped and enlarged, which further reduces clarity of the image. The brilliant sunshine at Willcox also enhances reflections off of shiny subjects like tiger beetles. Even for species that you can get closer to, the bright reflections can interfere with a good photo. I was able to get reasonably close to the White-lined Tiger Beetle in the image above, however most of the photos that I took of it were not usable because of the very bright specular reflections of of the eyes and the elytra. I'm not really complaining. The challenges of getting good images of tiger beetles is one of the things that I find fun about photographing them. That C. sexguttata pic is amazing. I had my own struggles trying to photograph tiger's this summer as well. I see you had far more success! Gosh Doug metallic paint work, does that come as an extra. Nice post, Doug! You've well-described some of the biggest problems with tiger beetle photography. I'm actually drafting a post with the working title "How to photograph tiger beetles" (I hope to come up with something catchier by the time I actually post it). It'll be awhile yet before it appears - I'll talk a bit about techniques for approaching based on different behaviors. I'm sure I've seen some sort of Tiger Beetles here at Grand Canyon. I'm just starting to learn about the insects. Nice captures without the sun glare. Just found you via Joan, I'll certainly be back. nobonesaboutit- Welcome to the Tapestry. Thanks, and don't stop trying to get good tiger images. They are such a cool group, and I've really enjoyed learning the art of stalking them to the point where you can get close enough to nab a photo. Toy- Heheh. The metallic look isn't a problem with all species- but it does make for some very pretty ones. Ted- Thanks. I'm looking forward to seeing what you will do with that subject for a blog post. Gaelin- Welcome to the Tapestry. You will have a bunch of different species of tiger beetles in the Grand Canyon. 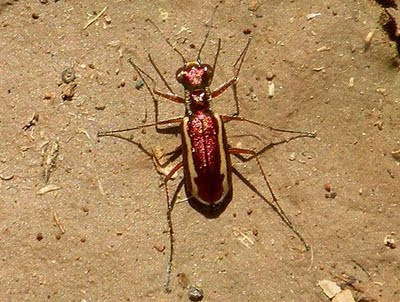 There is even a subspecies of the variable tiger beetle (Cicindela terricola kaibabensis) that is endemic to the Kaibab Plateau. It's very pretty- I would LOVE to photograph that species. Where is Willcox Playa? I'll be returning back thru s.e. Arizona and am longing to find my first tiger beetle. I thought I was on to one in Death Valley - tiny and red and fast - and then when I got too close it flew a few feet and it was all over. WOW...It's Beetlemania!!! LOL who would have thought beetles could be so colorful and so "metallic' in look!! While I am not much of a bug person, these are some good shots! Wow, those are some amazing beetles!